To backup a portfolio, watchlist or screener you can download it to a .txt file and save it to your computer. To do this, right-click on the portfolio, watchlist, or screener in the Navigation Panel and select ‘Export’ from the drop-down menu. This will download the portfolio, watchlist, or screener to the folder designated for downloads by your web browser. Note: Exporting or importing a screener only applies to the filter values of a screener, not the stocks that pass that screener. 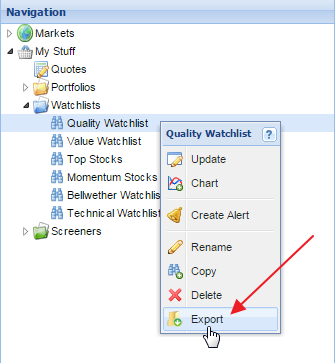 To export the results of a screener, first save them as a watchlist and then export the watchlist.